I had lunch in Meatpacking today after watching/supporting my man get a haircut at F.S.C – that’s love right there. The cobblestone in this area of NYC makes it my favorite place to hang, eat, shop, and don’t even get me started on the nightlife… I bought this white blazer I’m wearing from one of LF’s many amazing seasonal sales last year, you can’t really tell but it has shoulder pads which I love! 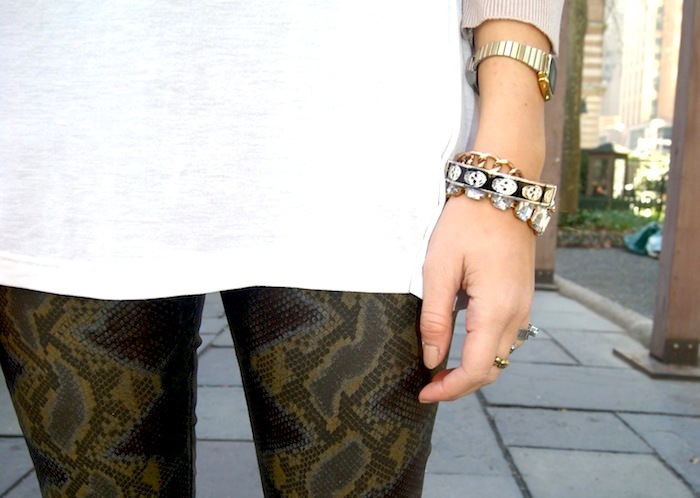 I’m still on the hunt for some amazing leather pants so I can stop wearing the same pair all the time, ah. If you have any suggestions please comment!! Loving all my new purchases featured in this post…and even more excited to introduce you guys to one my favorite new handbag lines, Remi&Emmy. The uptown girl in a downtown world inspired collection was designed for bloggers and street stylists that inspired the creators. And, guess who was one of them? ME! I worked with several other bloggers in the design collective for Remi&Emmy and can confidently say we did an awesome job. Check out more from the line here. Remi&Emmy is available exclusively at Dillards & Lord & Taylor. For my outfit: The All Saints jeans that come in five other colors are the perfect fitting skinny jean and you can’t see it here, but they have zippers on the back ankle. Yes, and bought a second pair too. My other new purchase are these oxfords that are on sale at Urban Outfitters for super cheap; if you haven’t realized yet, I love my oxfords and have this pair in the tan color (I spray painted the tips recently). Channeling Charlie Chaplin in Look 3 from the Quirky Menswear Blue Perk x WeWoreWhat photo-shoot. This time, it’s all about the modern trouser and contrast blazer, all white and a pop of color. I felt the Keds added a touch of irony and I turned gaga-eyed over this gorgeous white townhouse with the brightest red door I’ve ever seen. In look two of the Quirky Menswear Blue Perk x WeWoreWhat photo shoot, we are channeling Tom Cruise from Risky Business – proving why a white button down should be a staple in every women’s closet. Walking by this stoop on 11th street the other day, I knew I had to find a way to take pictures on it because it reminded me of childhood days with Hey Arnold and “stoop kid.” Good times. Hope everyone had a great weekend and is enjoying some Sunday Funday. I’m off to Caravan Studio now for a Socialyte hosted Oscar’s Party! Because who doesn’t love to diss celebrities in their oh-so-wrong Oscar gowns.